Akiva Pearlman holding his son Raphael, dressed in Chinese costume for the holiday in Beijing. Last week, Jews around the world celebrated Purim, one of the most important holidays on the Jewish calendar. At this time, Jews recall their escape from an evil plan hatched by a Persian minister to annihilate them. They wear costumes, drink copiously, put on plays, give gifts to each other and donations to the poor. And the Jewish residents of Beijing were no exception. Not only were they able to observe their religious customs, they had a choice of celebrations to attend. There was a party on Thursday night sponsored by the Chabad Lubavitch community (an orthodox organization); on Friday night, sponsored by the Kehillat Beijing congregation. And on Saturday night, the Israeli embassy also had a gathering. 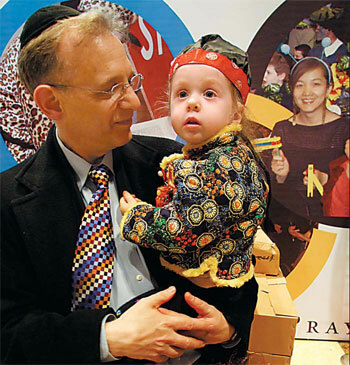 The fact that Jews in Beijing had more than one choice of Purim parties to attend highlights the options Jews have to observe their religion when they come to China. Jewish prayer usually requires a group of at least 10 people. This is one of the main reasons why Jews need a community. Most people assume that in corners of the world where Jews are not typically found, the Chabad movement will be the first outpost of Jewish life. Chabad is a Lubavitch Hasidic strand of Judaism and centers over the world support observing orthodox Jewish customs. In China, Chabad has seven centers, in and around Hong Kong, Shanghai, Beijing and Guangzhou. New Yorkers Liora and Akiva Pearlman have lived in Beijing for two years and were in Shanghai two years before that. They say life for a Jew is much harder in China than New York, but Chabad makes it easier. They are orthodox Jews, so in China, "Our only choice is Chabad," Liora says. Yet in Beijing and Hong Kong, where there are multiple communities, there are choices for those who are not comfortable with orthodox services like Chabad. Jews have various prayer customs. In Beijing, Kehillat Beijing has been around for two decades, much longer than Chabad, which came in 2001. The Kehillat Beijing differs from Chabad in many ways. For example, at Kehillat men and women pray together in mixed seating; while Chabad puts a divider between the genders. American Jeff Bernstein lives in Shanghai where the only choice for Shabbat services is Chabad. "I was not used to its style, with the wall down the middle. I felt foreign," he says. But when he goes to the liberal Kehillat Beijing, "I feel a community." Some Jewish people find themselves going to Jewish services even though they may not attend back home. Being with other Jews and by performing these rituals they find familiarity in a foreign place. Buy it online, a whole new way of shopping!